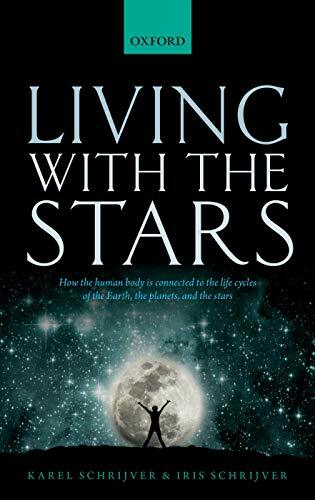 Living with the Stars tells the fascinating story of what truly makes the human body. The body that is with us all our lives is always changing. We are quite literally not who we were years, weeks, or even days ago: our cells die and are replaced by new ones at an astonishing pace. The entire body continually rebuilds itself, time and again, using the food and water that flow through us as fuel and as construction material. What persists over time is not fixed but merely a pattern in flux. We rebuild using elements captured from our surroundings, and are thereby connected to animals and plants around us, and to the bacteria within us that help digest them, and to geological processes such as continental drift and volcanism here on Earth. We are also intimately linked to the Sun's nuclear furnace and to the solar wind, to collisions with asteroids and to the cycles of the birth of stars and their deaths in PHI15SCImic supernovae, and ultimately to the beginning of the universe. Our bodies are made of the burned out embers of stars that were released into the galaxy in massive explosions billions of years ago, mixed with atoms that formed only recently as ultrafast rays slammed into Earth's atmosphere. All of that is not just remote history but part of us now: our human body is inseparable from nature all around us and intertwined with the history of the universe.